"Look it up" - "Do your homework" Do these terms sound familiar? We hear them all the time on school campuses. It's time to start applying them to your own 403b retirement planning process. Clarity - You want to have a clear picture of what your 403b plan is investing in, why your investing in it and how it's helping you save for retirement. Control - You want to have more control over when and how you retire. You've seen the people who are forced to continue working late into their lives because they did not plan/save correctly. Confidence - Most of all, School employees want the confidence that they are investing in something sound, with someone qualified with a 403(b) plan that gives them a good chance at the retirement they're dreaming about. There are many excellent financial advisors that specialize with Teachers out there who are ready to help. This book can be a help in finding one. What does the 403(b) retirement planning process look like? What questions should you ask? What steps should you take? These topics and more are covered in Schooled... 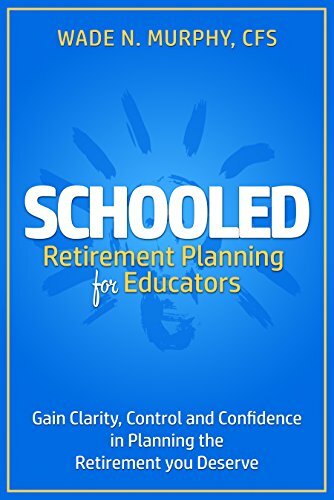 Your guide to gain clarity, control and confidence in planning the retirement you deserve.